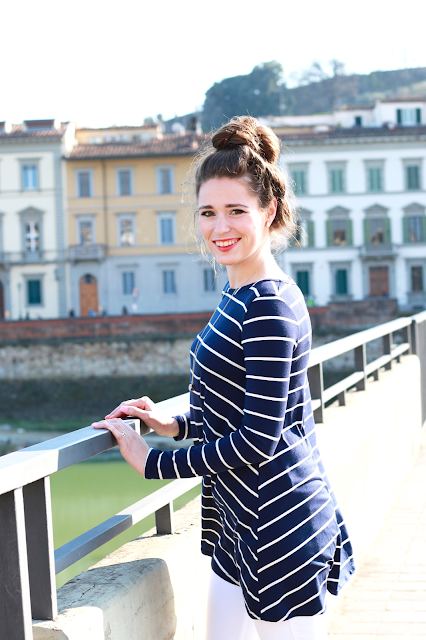 Navy and White Outfit in Florence. 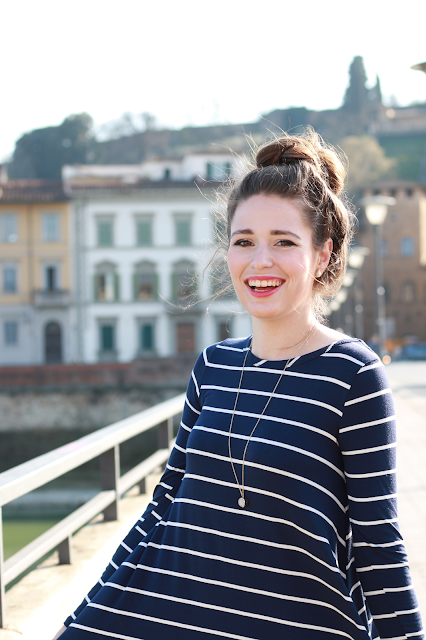 Continuing with my Italy trip adventures by sharing this outfit from a day out in Florence. It seems like I was there yesterday... I can't believe it was two months ago! I wore this outfit for a day of museum touring in Florence with my mom. This was one of our "free days" on our Italian tour adventure, and since my mom is an artist, she was really excited on this day in Florence to explore the famous Uffizi Gallery musuem, which is one of the largest museums in the world for renaissance period art. While I do enjoy certain types of museums (aquariums are my jam), art museums aren't my favorite. Growing up with an artist mom, I spent my fair share of time as a kid getting to visit different ones, both in Maine and also on vacations around the US. I'm not really sure why, but I've just never clicked with art museums. Just not my thing? But anyways, I'll share more about our Uffizi visit and what I thought of it in my Florence Travel Guide, but this is the outfit that I wore for a day of museum and city exploration! I love looking at travel bloggers' Instagram photos and blog posts of Europe trips, and other destinations as well, and marveling at their amazing outfits and hair/makeup. Even though I've been to Europe a few times now, I haven't found that I've been able to pull off fashions that fantastic when I travel overseas- just being real! On our Italy trip, our tour company had a one suitcase requirement, and our personal item was limited to strictly a personal item like a purse or camera bag, not a carry-on suitcase or duffel like the airlines allow! So that meant I had to be very strategic about packing for this trip, and for the most part everything I brought had to be able to be worn in multiple outfits. That's how this outfit came to be! I wore these white jeans and this navy and white top throughout the trip, but I loved the way they looked together for this day out in Florence. Italy wasn't too warm when my mom and I were there in March, but this specific day in Florence was sunny and on the warmer side, so I was fine without a jacket. Hope y'all are having a great Monday! It has been raining all weekend here in Vermont so I am REALLY excited to see the sunshine that's in our forecast for the rest of the week. Ahhh I posted a Florence outfit today and we took them in almost the same place!! And I feel you on the packing- unless you're strictly traveling to take fashion photos, you have to be practical. Can't wait to read your travel guide! Florence is on my bucket list! I'd be right at home with your mom. I studied Art and Architectural History in college so visiting museums is my favorite part of any trip! A. I want to go to Florence so badly and B. your outfit is adorable! Love this outfit - so cute! I've always wanted to go to Florence. Such the perfect European look!!! Happy your sharing more pictures from your trip!! Love this outfit! Love Florence also. Florence!!! omg jelly I would love to go one day. Such a great outfit. This is a great casual outfit for a day around being a tourist! I would LOVE to go to museums, haha! Gorgeous photos! Such a practical traveling outfit! And aquariums are my favorite as well haha - but I bet the museums in Florence were great! I feel like you should go sailing in that outfit! 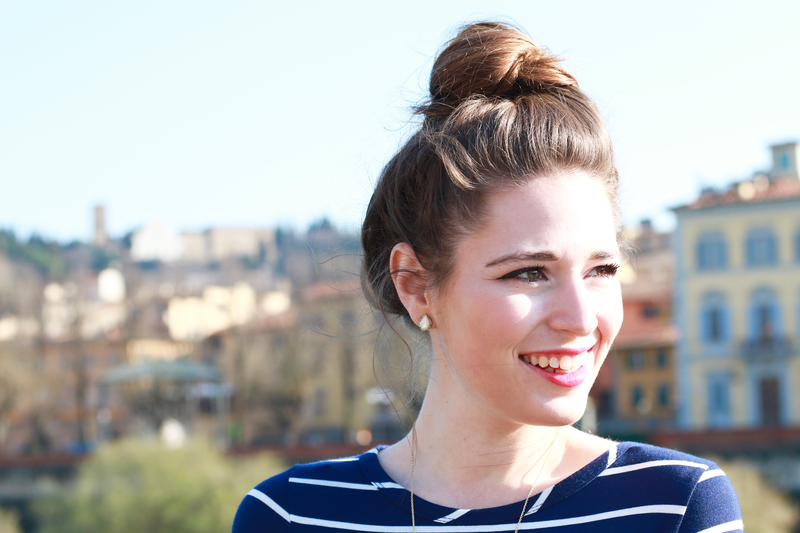 Such a cute look and perfect for a day in the beautiful city of Florence! You can never go wrong with a good navy and white stripped top! Also totally get you on not being super fashionable during trips abroad! Style over comfort is a must for me sometimes! This outfit is so cute, Annaliese! I love your striped top! I definitely could never abide by a tour company's packing guidelines! I love being able to have ALL of my stuff with my whenever we travel! You look beautiful! driraborspellcaster@gmail.com or call him on +1(301)909-8775. and share a wonderful testimony just like me. Better Late Than Never: Best Memorial Day Sales! Bold White Dress + My Spring TV Schedule. Where To Shop For Cheap + Cute Swimwear. Why I Decided To Do A Four Week Shopping Fast. A Love Letter to Charlotte NC. How to Dress Up a T-Shirt.